So there is only a week and a half left before Thanksgiving, and I’m packing them full of Thanksgiving goodness which isn’t easy when I have a half day off for Homeland Security PD and then another day off for . . . wait for this . . . Opening Day of Firearm Deer Season. It’s true. In Northern Michigan, they figure half the school would call in sick so they might as well have it off. It’s a cultural thing. So in any case, I wanted to let you see some of the fun stuff we’ve been doing. Of course, I’ve linked the pictures when possible to the activities so go ahead and click away. If you know anything about me, you know I LOVE my sensory table. I wish I had a bigger classroom for it but I make do because I refuse to get rid of it. Activities in this table are generally a favorite of my naturalist and kinesthetic learners. This week it’s just shucking corn, measuring and weighing it, but next week or so I’ll put in a literacy component to keep it going until I change it over for the holidays. 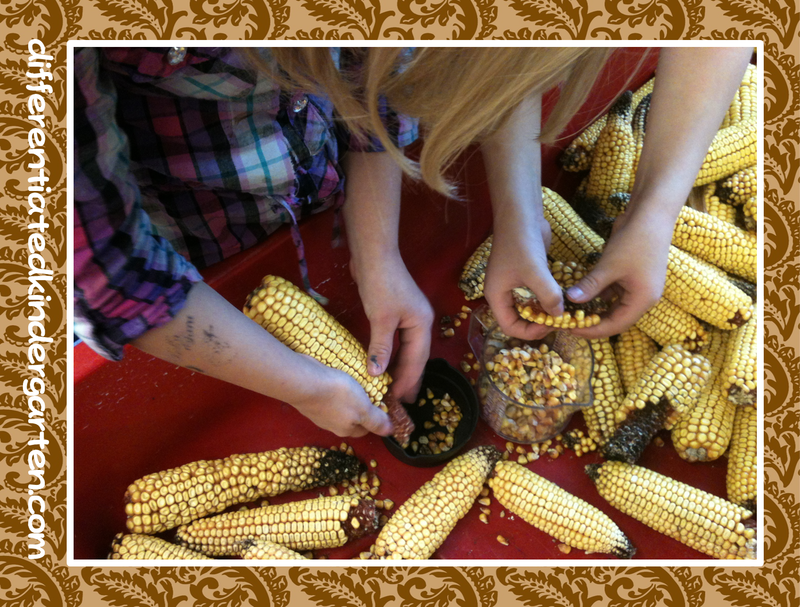 Do you still have a sensory table in your classroom? 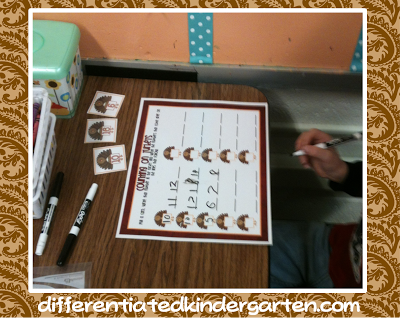 Write the room for ten frames and CVC/CCVC/CVCC words too. I have both going at the same time. They are both differentiated so that some students are working with smaller numbers or a different skill (perhaps making ten for instance versus just counting or counting on) but they are all working on the same activity…writing the room. The reading write the room for Turkey time are the colored little turkeys you can see posted. For a different twist, this time I hid pictures in the turkey and had the kiddos search for the turkey and then search the turkey for the hidden picture. When they found the picture within the picture, they either wrote just the beginning sound, beginning and ending sound of the entire cvc or ccvc/cvcc word depending on their readiness. If you want to check out that write the room activity, just click HERE. After making his Thanksgiving Story bracelet, this little guy is now is going to try his hand at writing with a turkey feather. This center appeals to SO many intelligences. It’s a class favorite for sure. What’s for dinner? 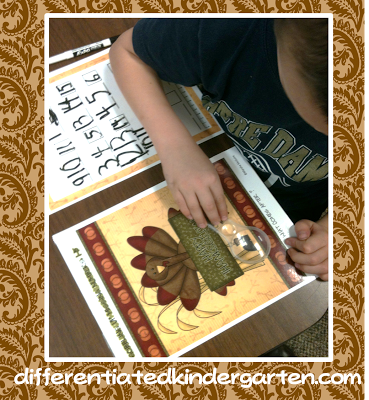 is one of seven math centers in my Thankful for Math Galore pack. In this game students get to use a SPINNER (what kid doesn’t love a spinner) to determine if the BIGGER or smaller (I also have an odd and even spinner for those students who are a bit more advanced) is the winner. 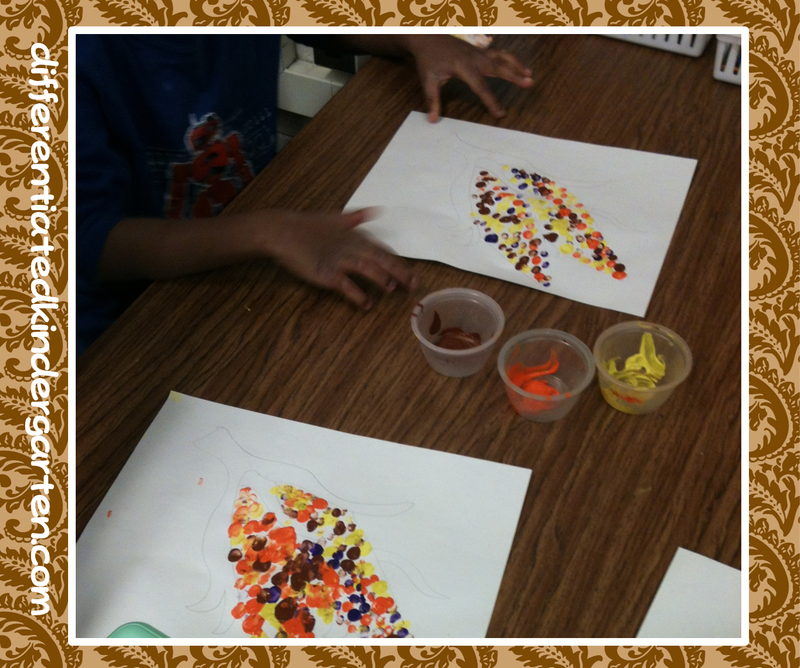 In my art center we are making “Indian Corn” using pointillism pinkies. They are turning out soooooooo sweet. I just love ’em. 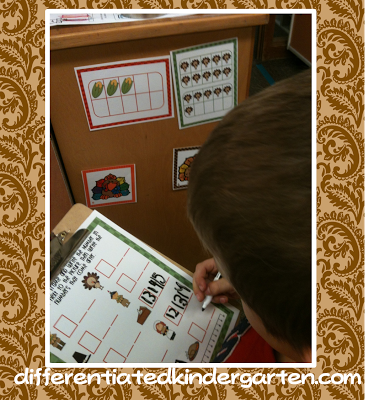 Gobbling Up Missing Numbers I Spy is a new I Spy math station. Here one of my students is using the 0-20. He spies two consecutive numbers such as 11 12 and then writes the missing number that comes after. There are options for numbers that come before and numbers that are between in 0-10, 0-15 and 0-20 to align to common core and differentiate base on readiness of your learners. 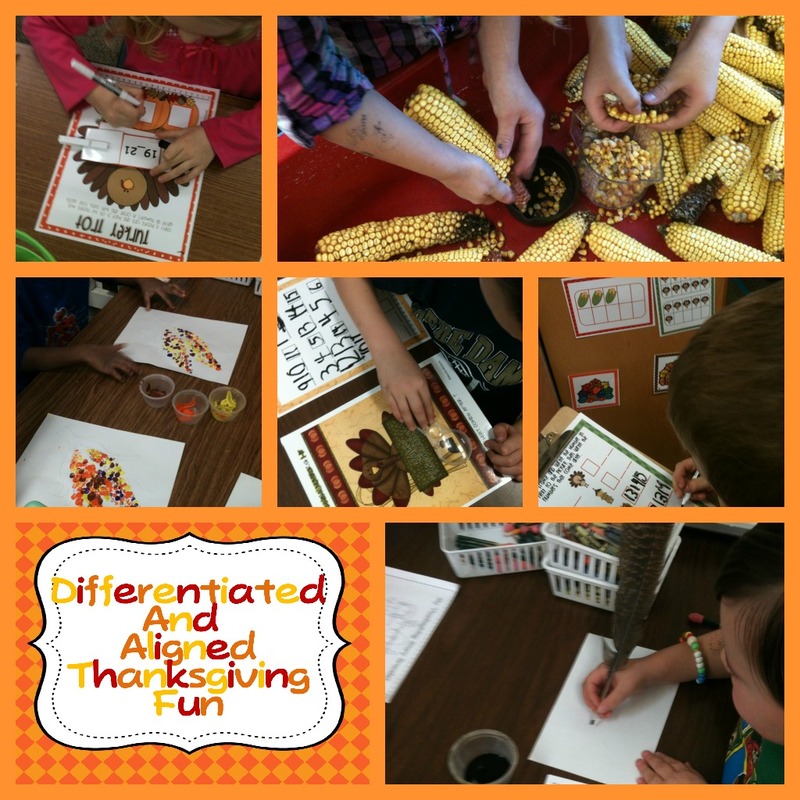 I also have a letter and sounds I-Spy for Thanksgiving if you’re looking for an ELA I-Spy. Go ahead and click HERE to check that one out. 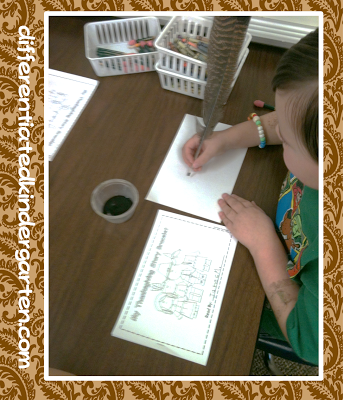 My kinders are loving Deedee Wills’ Thanksgiving Writing Center. I have it for every month. It’s easy peasy and ready to go. One less thing for me to plan. 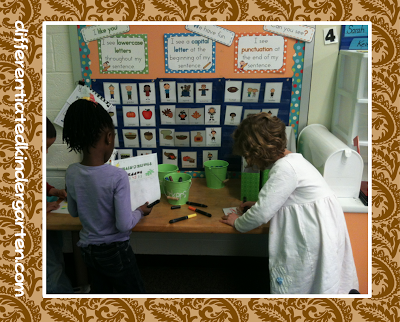 I love the word cards that they can grab and copy, and they love the choices they have. Thanks Deedee. Love it. 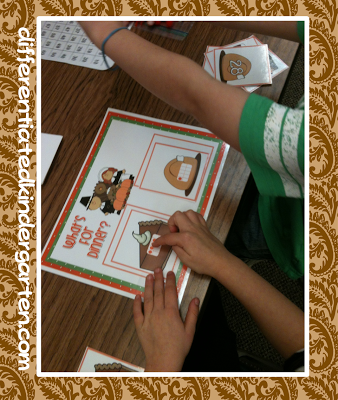 Counting on Turkeys is another game from Thankful for Math Galore 7 Math Stations in One Packet. 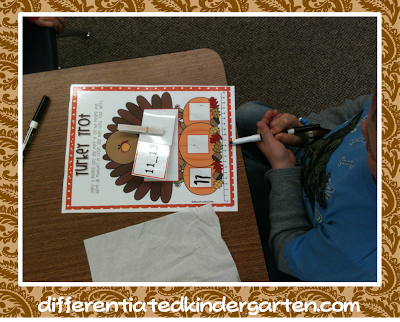 Students grab a turkey from a bucket, write the number and then write the numbers that come after. And this is what it looks like when all my 26 little ones are working away. I know that these pictures make my room look big, but I promise you it’s tiny. But by spreading them out and getting them working independently, it certainly doesn’t look like I’m sporting that many little bodies does it? Hope your finding lots of great activities for celebrating the season of Thanksgiving. 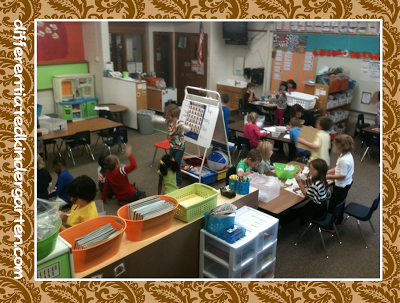 I can’t wait to post pictures of our kindergarten wide (that’s 75 in my little school) Thanksgiving Feast. I’d love to hear what kinds of activities you have planned. In the meantime, I’ve had a bunch of readers write and make requests for specific holiday items for December. Thank you so much. It helps me to know if you are working on specific skills or themes. I promise I’ll have a couple of freebies for you too. So stay tuned. Here’s one thing I have done so far. It’s for sight words, but I really need to make another for letter sounds and identification still because some of my kinders are still not as fluently as I would hope. How about you guys? I also have a couple more projects in the works for after my boys go bed tonight so check back. Bountiful blessings of beans and more! Love these ideas!!!! I am wondering how they shuck corn??? Did you dry out the corn first? I love the new holiday sight word pack. 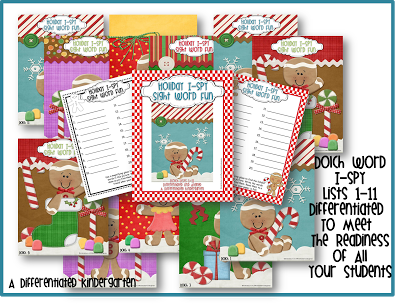 I also would like some holiday packs that help with letters and sounds…still working on that in my room. Thank you for all you do. We use so many of your things in my room!!! Thank you so much for sharing. I was wondering about the posters in your writing center. Do they say; I see lowercase letters? Also, are they on your website somewhere? I can’t seem to get the thanksgiving story bracelet and reader freebie??? could you email it to me? What are you putting in your sensory table for the month of December? I looked at your past posts and love the ideas for March and paleontology…do you have a fabulous idea for December? 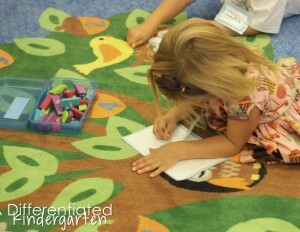 I am a seasoned teacher who just moved to kinder and I want to make my classroom a place of learning and fun! Your blog inspires me and helps me to become a better teacher. Thank you for all you do and share!